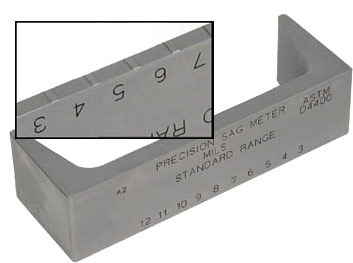 Sag Meters produce a series of equally spaced coating stripes of varying thickness. When placed on a vertical surface, the stripes reveal the thickness at which the coating resists sag. Meters for all coating thickness ranges: High (14-60 mil), Medium (4-24 mil), Low (1-6 mil) and Standard (3-12 mil). This flow and leveling applicator is a much larger version of the standard sag meter with an extended range from one to 18 mils which includes a widened six mil section relative to all the others.